Squeeze My Belly To Turn Me On! 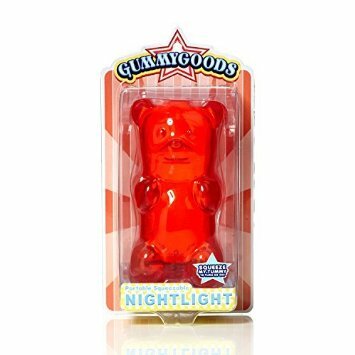 The GummyGoods Nightlight is an homage to the most iconic candy the world has ever known. It looks and feels like an actual Gummy Bear, just 100 times bigger and infinitely more useful. Squeeze its belly and, instead of getting your fingers sticky, a high-powered LED light switches on, illuminating the immediate space around you. GummyGoods Nightlights come in pink, blue, purple, red, green, yellow, and orange. GummyGoods Nightlights are powered via (2) AA batteries (not included). GummyGoods Nightlights stand 7" tall and are 3" wide. Features a squeezable tummy on/off switch. Features one hour and infinite timers. Wall mountable: hole in back for nail or hook. Packaged in a window display box with original artwork and nutritional facts.